The Deluxe Swivel Seat Cushion benefits the elderly, disabled or others who have difficulty getting into and out of vehicles, chairs or other sitting situations. 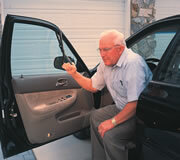 It enables individuals to easily swivel while in a sitting position and to swing their legs into or out of the car. 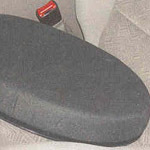 The seat cushion is 15 inches in diameter and 1.75" inches deep. It is made of a dense, soft foam resting upon a swivel base of a durable plastic. 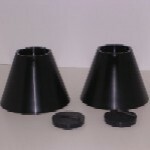 The plastic base contains the swivel mechanism which uses ball-bearings and roller to achieve the 360 degree rotations. 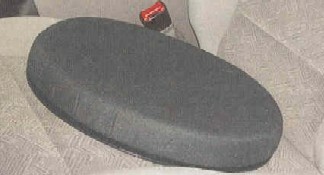 The seat cushion can rotate in either direction. The swivel base is also flexible and adjusts and contours to the shape of the seat of the vehicle or chair. This base also has a non-skid and non-slip bottom cover to ensure safety. The removable cover is made of a breathable polycotton fabric which is machine washable. 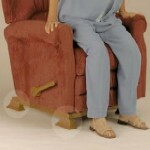 The weight of the cushion is 2.4 lbs and has a weight capacity of 300 lbs. The CarCaddie offers balancing support when getting into and out of vehicles. EasyRisers chair and bed lifters can raise your bed or chair to the desired height for easy sitting and rising with ease. Mix and match with a different size for the perfect combination. Pkg. of 4. 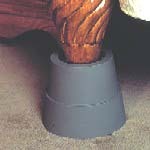 Furniture Risers adjust the height of a couch, bed, chair, or table to make sitting or standing much easier; especially for people with limited mobility or wheelchair users. The wide deep base of each riser fits most sizes of bed and couch feet.